Fancy a change from crêpes this shrove Tuesday? Follow this recipe for delicious, moreish, vegan fuffy pancakes – just perfect for drizzling with maple syrup. Measure the milk into a measuring cup. Add vinegar and aquafaba, and use a fork to vigorously mix the ingredients until foamy. This will take a minute or so. Pour the milk mixture into the center of the dry ingredients. Add the water, rapeseed oil and vanilla and use a fork to mix until a thick, lumpy batter forms. That should take about a minute. It doesn’t need to be smooth, just make sure you get all the ingredients incorporated. Lightly coat the pan in oil. 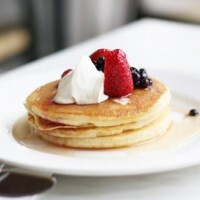 Add a dollop of batter for each pancake, and cook for until you see air bubbles on top (about 3 or 4 minutes). Flip the pancakes, adding a new coat of oil to the pan, and cook for another 3 minutes or so until they are puffed up and golden brown. Rest pancakes on a cooling rack covered with tin foil until ready to serve. To reheat, place pancakes in on a baking sheet covered with tin foil in a 180C oven for 5 minutes or so. 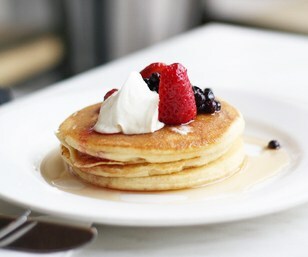 Top with your favourite toppings – we love to top ours with seasonal berries, whipped coconut cream and maple syrup.